Pease use 'submit' button in top right to feature your sighting to be featured. If you wish to add any feedback to these sightings (or have seen them in the same area yourself) please reply to this post. August 10 2013. 8:30 pm. The east side of the Las Vegas Valley. 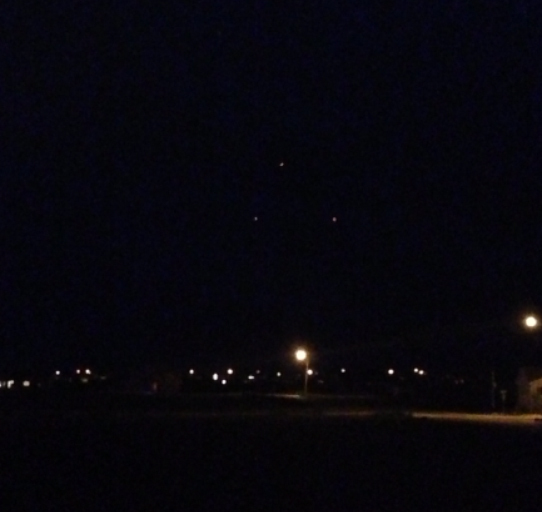 Mutiple ufo's were spotted traveling from east to west towards the valley. As they got to the rim of the valley they hovered for 5 minutes. It was like they were exposing themselves intentionally. The soon blinked out. This thing flew over us and the triangular shape kinde turned upsight down and it looked like the object was also rotating. That was the moment when we got really histerical because we thought it wil come down to us just before it disappears for a moment behind the trees. It really looked like that for me and my friend. I also felt it moved in a weird manner but i think the video is not bad expect for me shaking so much because i was scarred and high. i was aiming with the phone at it but looking in the sky and I always tried to readjust the aim. I have cutted the sound out because it is emberassing how histerical me and my friend were. Please watch this and tell me your opinion. Take a good look between 22 seconds and 30 seconds. Im still high but i think you can see through the lights blinking on and off kind of the shape of the object. It really terrified me. I am very skeptcial about this stuff. I have also seen some mintues ago an airplane that also was very low and through its lights, you could see the shape of the airplane. just simply knew, that it was an airplane. The object in my video though, was bigger then the airplane i had seen after it but belive me, you couldnt see its shape it was too dark even though it was so low. As if a dark light was shining on the ship itself. Until watching a news story last night on FOX 9 in Minneapolis. We were in northern Minnesota last week, in Two Harbors which sits right on Lake Superior. We were outside late at night Thursday or Friday August 8th or 9th, looking out over Lake Superior at about 9pm when we saw a few orange'ish lights moving in unisen over the lake, their movement was completely in sync with each other. We discussed for a few minutes wondering what it could be, but when we gave up we went back to our drinks, which was not the reason for our visions! This strange fast flying craft seems to change colour. The filmer said the chance it was RC craft was low because no sound was made - what do you think? Note if anyone was also in downtown Minneapolis and also saw these lights please reply to this post asap. Eyewitness: I was walking to downtown, from my place in uptown, via Loring Park. I spotted two objects hovering in the NE sky. At first I didnt pay much attention to them as I thought it was just helicopters perhaps. But then, one looked like it was sort of checking out the Basillica. Im not sure how far away they were, so it may have just been a quirk of viewpoint and unrelated to the Basillica. The objects themselves were dual colors. They looked like two square lights of some sort attached to one another, which you cant tell from the video due to the low quality. If I remember correctly the colors were a solid blue and green, but dont quote me on that... I cant recall for sure. In the video each object appears a different color versus each being a dual color. Before I started to record, the second object had been hovering back and forth. Its the object you see hover up from the lower left in the video. How did I lose sight of the objects? See the video. They did their thing and then flew off. The second one looked like it had been landing or taking off before I started recording. Its hard to tell for sure though without a better idea of distance though. A video showing strange lights hovering over a pool in Naples Florida for nearly 30 minutes. Residents say they have never seen anything like it and experts aren't sure either. Here in this video are both news footage and surveillance camera footage. This has been the talk of the town for a few days - what do you think it is? 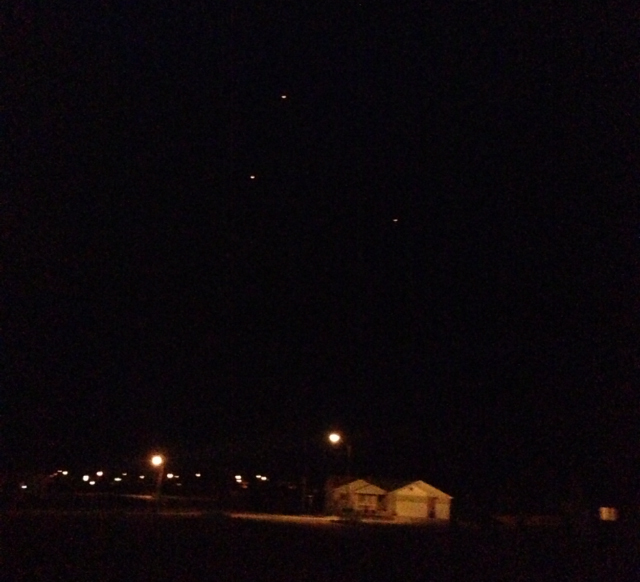 These incredible photos come in from South Dakota 30th July2013.We are calling on anyone in the state who witnessed these UFO lights to please respond to this post & submit a Mufon report. Witness comments: These UFO lights appeared one at a time and stayed for about 20 minutes and hour later you could see military aircraft searching for something in the area. It was completely silent and very scary. This strange footage show some hovering UFO object over Stamford in the UK. Was it a RC craft or something other wordly? If anyone in Stamford would like to make a comment please reply to this post if you have also seen strange lights in the area.